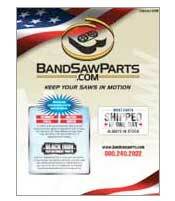 The best in horizontal band saws. The Series 15 is perfect for fast accurate, high production operations. With the programmable control the operator can easily program cut-off length, and number of cuts. The 10 ft. long shuttle table has a 14,000 lb capacity. Optional "M10" feature includes a 1-1/2" wide blade and 10 H.P. motor. Driven Pulley or Variable Speed Pulley for model #15A7 and newer. This type of drive package consists of a mechanically operated driver pulley mounted on the motor shaft, to a spring-loaded driven pulley. Driven Belt or Variable Speed Belt for the 15A7 and newer. Drive Sheave with tapered lock hub which is located on the intermediate shaft with the driven variable speed pulley. Also recommended P AB 15-AD115 drive belt. Idler Sheave or Pulley with bearing tapered lock hub. Also recommended P AB 15-AD115. 4 stranded V Belt located between the variable speed system and the transmission input shaft. Bearing for counter shaft in the variable drive system. Precision locknuts are used to adjust, preload, and secure bearings, gears, and other power transmission products to shafts and spindles with a high degree of stiffness. Bearing Lockwasher is used on counter shaft to secure locknut. Motor Pulley or Variable Speed Pulley located on the drive motor for the saw blade on 15A7 and newer. Belt Pulley located on the input shaft of the transmission on 15A6 and older. 3 stranded V-Belt located between the variable speed system and the transmission on 15A6 and older. Motor Pulley or Variable Speed Pulley for 15A6 and older. Driven Pulley or Variable Speed Pulley for 15A6 and older. Drive Belt or Variable Speed Belts for Marvel model #15A-6 and older. Cylinder Cap for the P AB 81-ABR3 ratchet nut. Chip Screen which fits inside chip drawer to strain chips from coolant. Chip Screen which fits under chip drawer in machine base. A centrifugal pump which supplies coolant to the saw blade. Also recommended is the P AB 15-DBR6-C intake screen. Replacement screen for P AB 15-DBR6-C. This Timing Belt is located on the length indicator on the shuttle table. It turns the length counter on the table. This Timing Belt is located on the length indicator on the shuttle table. It turns the Inch Length Counter on table. Work Light has flexible extension to position light exactly over work. Limit Switch with roller actuator for head height selector. Limit Switch located in saw head behind height selector panel actuated when saw head is at bottom of stroke. Three position selector switch for cycle selector (1ss). This Selector Switch is a 4-Position switch that controls the movement of the saw head. This is the replacement switch for 15A9 and newer machines. This Spring is for nonpowered chip brush assm. with 2" wire brushes. Chip Brush for power chip brush unit. Sold as a pack of two brushes. Blade Guide Holder Assembly or carbide blade guide which fits dove tail adapters. Dove Tail Clamp for side guide P AB 15-BD2-A. Hydraulic Ratchet Nut Oring Seal Kit is used to repair leaking vise clamps. 4-Way Valve for vise activation. Service Kit For Compensator Valve that controls the rate of fall as the head becomes more paralell to the machine base. Filter Element or cartridge for canister in Hydraulic compartment. Head Cyl. Service Assy or seal kit for saw head lift cylinder. This is a 0-200 Lbs. glycerin filled gauge. This gauge is used to read feed pressure. Liquid Level Gauge or Fluid Site Glass used on machine base for coolant level. Also used on control console for Hydraulic fluid level. Manifold Seal Kit for shuttle control manifold on shuttle table. This kit enhances machine performance and solves leaks due to brittle and worn orings. Piston Boot or Bellows which protects the lift cylinder and flex shaft from dirt and shavings. Strap or Clamps for piston boots. Band tension Handwheel used to tighten saw blade. Oil Seal or radial lip seal for the idler wheel bearing hub. Bearing Retainer on idler wheel hub which also retains seal P AB 15-BB61. Blade Driver Wheel Adaptor or Drive Wheel Hub retains drive wheel to the output shaft on the transmission. Blade Driven Wheel Adaptor or Idler Wheel Hub. Height Selector Bushing is located in the height selector panel. This bushing stabilizes the height selected shaft and knob. Brass Bushing for saw head pivot. Thrust Bearing for band tension screw. Bronze Bushing for band tension screw. Shaft and Flange Assembly's are one piece output shafts which support the blade drive wheel. Oil Seal or radial lip input seal for 15A transmissions. Seal Carrier retains input seal in the transmission. Sleeve or output shaft seal race. Cover retains output seal in transmission housing. Oil Seal or radial lip seal located behind blade drive wheel. Oil Gauge or fluid level gauge for transmission. This is a tapered roller bearing used on the input shaft of the transmission. The input bearing consists of a cup and a cone sold as one item. This a tapered roller bearing that fits on the output shaft of the transmission. This output bearing consists of a cup and a cone sold as one item. This locknut or spanner nut is used on the secondary shaft of the transmission. This locknut or spanner nut is used on the output shaft of the transmission. This Bearing Lock Washer is used on the secondary shaft of the transmission. This Bearing Lock Washer is used on the input shaft of the transmission. This Bearing Lock Washer is used on the output shaft of the transmission.